On January 27th and 28th, the World Cup Skateboarding (WCS) is organizing the Amateur Combi Pool Party at Van’s Skate Park – Orange. The total prize purse for the event is $5,000. The contest is featuring the top Amateur Bowl skaters in two age divisions: 15 and under & 16 and over. All skaters are by invitation only. The list of the participants was posted a couple of weeks ago. Among them are lil’ rippers like Archer Braun, Kiko Francisco, Asher Bradshaw, Morgan Wolf, Cory Juneau, Evan Doherty, Alex Sorgente, Heimana Reynolds, Austin Poynter and Aidan Dansey; to name just a few of them. I met Aidan Dansey at the Vans Combi a couple of weeks ago. That was not yet the craze before the Ams Combi Pool Party when all the participants are trying to get use to the pool curves before the contest. That’s what’s happening the week before the contest. Aidan just got sponsored a couple of weeks ago by Flood Kontrol, a brand owned and managed by Randy Aparicio, an ol’ pal skater from the late 70’s that knows how to stay true to its roots by skating trannies and ditches and by manufacturing all his boards locally in California. isTia.Tv: When did you start skateboarding? Aidan dansey:I started skating when I was about 8. My dad skated when he was young, so our garage was always full of old skateboards and I guess one day I just wanted to give it a try. I’ve been hooked ever since. isTia.Tv: What is your specialty? 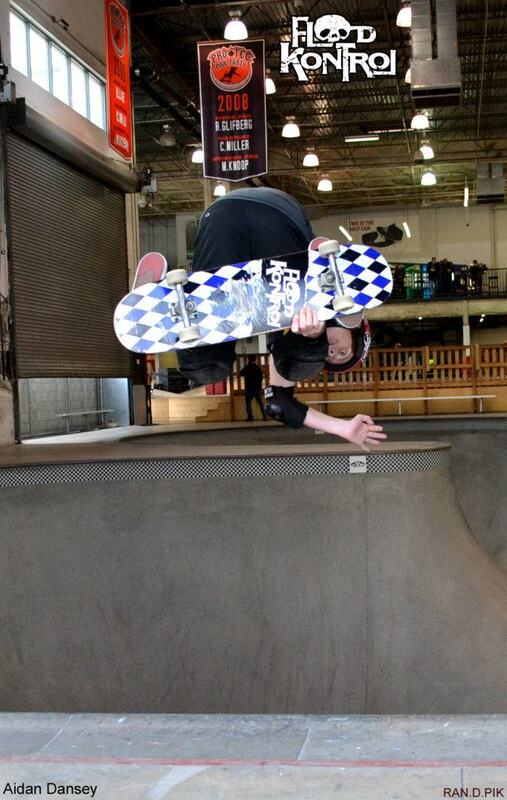 Aidan Dansey: I prefer to skate vert and bowls. isTia.Tv: When was your first skate contest? 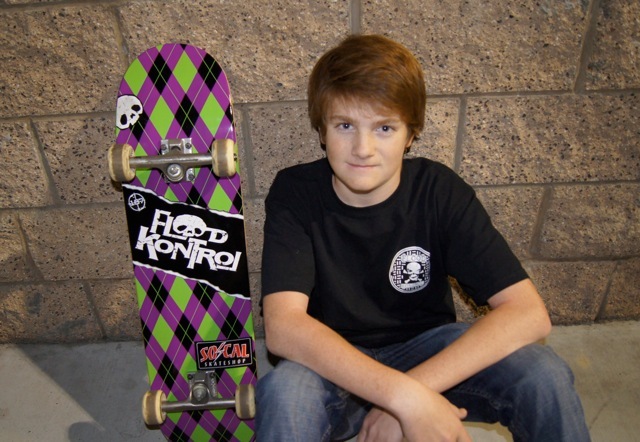 Aidan Dansey: My first contest was a CASL contest in 2008 at Skatelab in Simi Valley. isTia.Tv: Hometown / Where do you live? Aidan Dansey: Laguna Niguel, California. isTia.Tv: What are your favorite skateparks? Aidan Dansey: Definitely the Ecke YMCA, Vans, Etnies and of course Woodward West but one of my most memorable spots I’ve been to is the Baldy pipeline in San Bernardino. isTia.Tv: Where do you skate? Aidan Dansey: I usually skate parks in San Diego, but lately I have been skating at Vans a lot. I have also been lucky enough to skate the Monster/DC vert ramp a few times and that is always an unbelievable experience. isTia.Tv: How many hours do you skate a day? Aidan Dansey: My school schedule is pretty busy right now, so during the week I cannot skate too often, but during the weekends, breaks and summer I skate everyday until the lights at the park go out. I skate whenever I can! 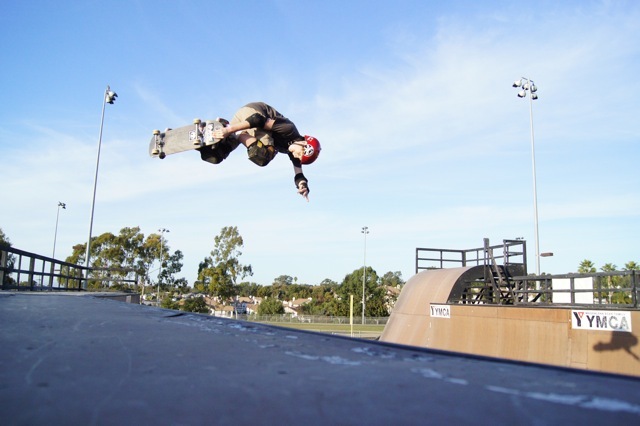 isTia.Tv: How were your parents involved with skateboarding? Were there supportive? Aidan Dansey: Ever since I started skating, my parents have been behind me one hundred percent. They drive me everywhere, whether it’s down to Encinitas to skate vert or up to vans to practice for the Am Tec. I am so lucky that I have very supportive parents that enjoy the sport and watching me do what I love. isTia.Tv: Who are your Sponsors? Aidan Dansey: Flood Kontrol, Socal Skateshop, and 187 Pads (flow). isTia.Tv: What are you gonna do to train for the AM Combi Pool Party? Aidan Dansey: I am skating the Combi as much as possible and enjoying skating with everyone else that is in the event. isTia.Tv: Who do you see in the Podium at the Combi Pool this year? Aidan Dansey: It’s hard to say. I have probably skated with half of the skaters that are in the event and everybody is ripping, anyone could be on the podium. isTia.Tv: How have you tried to prepare for the Protec contests in the past & this year? Aidan Dansey: This is my first year doing the AM Tec contest so I am just working on new tricks and getting used to the endless lines in the Combi. I’m trying to skate the Combi as often as possible. isTia.Tv: Have you participated at the Am Pool Party before and what was your ranking? Aidan Dansey: No. This is my first year. Hopefully I’ll be back next year and be able to answer this question again! isTia.Tv: Have you ever been injured while skatin? If yes, what, when, what happened? Aidan Dansey: Lots of hard falls, but luckily never any broken bones, stiches or concussions. isTia.Tv: What have you done in the past 3 months? Aidan Dansey: I drove to Canada in December to visit family and was able to hit up some parks up there and in Oregon. I also did the Dave Hackett event at Clairemont which was really fun too. isTia.Tv: What were the last contests you did? Aidan Dansey: The Etnies Halloween Bowl Bash, the Damn Am at Woodward West and the Tim Brauch memorial contest in San Jose. isTia.Tv: What was your best contest of the year? Aidan Dansey: The Tim Brauch memorial was a blast. Lots of masters showed up like Steve Caballero, Jeff Hedges, Christian Hosoi, and Pat Ngoho. isTia.Tv: What trick are you working on? Aidan Dansey: 540 in the Combi and Lean-to-Tails. isTia.Tv: List your three favorite music bands? Aidan Dansey: Modest Mouse, Black Keys, The Gromble. isTia.Tv: Goals for 2012? Aidan Dansey: Over the last six months I have really enjoyed meeting new people that share the same passion as I do. So my goal for 2012 is to skate with them more often and continue to push my skating to the next level. I hope to skate in more events like the AM Tec. Good Luck for the Vans Ams Combi Pool Party! Thanks to Flood Kontrol for the pix.